League baseball is back. On March 1, 2019, Estancia Eagles took on first year rival Orange Panthers at home in the first game of league baseball. Estancia came in at 3-3, and Orange came in at 2-1. Estancia won the game 4-0 through 6 ½ innings. Junior Jake Covey for Estancia made the start against junior Johnny Long of Orange. Both pitchers pitched complete games. With the first batter of league, Jake Covey struck out senior Justin Nock to begin the new season. In the first inning, Jake Covey struck out the first and third batter and the second out was a flyout to right fielder Josh Caldelas. With Estancia up to bat, first up is senior Hayden Pearce, who ultimately struck out. Next up, Nick Perales hit a single to begin the upcoming scoring circuit for Estancia. By the end of the first, the Estancia had four runs (one of which was an error committed by Orange junior shortstop Ralph Casillas). After the first inning, it was a pitcher’s game. Throughout the final 5 ½ innings, there were only a combined five hits by both teams ( 3 for Orange, 2 for Estancia). 11 out of the 27 outs in the game, roughly 41%, were strikeouts, 5 of which were looking. A majority of the other 16 outs either found their way to either third baseman Matthew Kehoe, shortstop Jake Alai, right fielder Josh Caldelas, or left fielder Troy Huber. For Orange, the defensive story is pretty similar, except there were fewer strikeouts (7) committed by Estancia. Similarly, a majority of the outs by Estancia found their way to third baseman Bryan Zaragoza, shortstop Ralph Casillas, or right fielder Elijah Wilson. Since Estancia was winning by the end of the top of the seventh, Estancia did not have to bat in the bottom of the inning, completing game. Jake Covey finished the game with 11 strikeouts, 3 hits, 2 walks, and 0 runs. Johnny Long of Orange finished the game with 7 strikeouts, 5 hits, 1 walk, and 4 runs. This week, Estancia will play at home against league rival Calvary Chapel on Monday, March 4, 2019. Orange will play at home against non-league opponent Cerritos also on Monday, March 4, 2019. In the second half senior keeper, Kimberly Martinez directed her defense with open communication and stopping each of Lynwood’s offensive advances. Junior defender, Adriana Ruiz stated, “Our first half, we weren’t playing our best game but we were more calm whereas in the second half I feel like we panicked way too much trying to get a third goal.” On Wednesday, February 6 Estancia will be taking on Hemet High School at Hemet High school at 5pm in the CIF Southern Section first round. On January 11,2019 at the Jim Scott Stadium, the Estancia boys varsity soccer [2-1-1(league) and 10-5-2 (overall)] beat Orange High school 4-2. Senior, defender Brian Alvarez was injured about the 20-minute mark and did not return until the second half as Orange continued to play aggressively. Senior, Gerardo Leon scored the first goal of the game on a corner kick, giving the Eagles a lead 1-0. Minutes later Leon was injured and did not return until the second half. Orange responded with a goal of their own and a quick second during the extra minutes before half taking the lead 2-1. Entering the second half, both teams raised their intensity. In the eighth minute Orange received a yellow card for pushing senior, Daniel Delgado. Some key passes led to senior Fernando Martinez tying the game up 2-2. After the exchanging of fouls and yellow cards. Junior, Marcos Arreola broke away for a shot on goal but missed. Orange earned a red card resulting in them playing down a man for the rest of the game. In extra minutes Senior, Miguel Peña scored on a penalty kick opportunity along with Leon scoring his second of the game putting it away 4-2. On January 16 Estancia will be taking on Calvary home at 5pm. Estancia boys soccer rang in the New Year with a 2-2 tie of versus the Santa Ana Saints on January 4th. In the first half the Estancia defense held their ground against Santa Ana’s offense until the last 11 minutes when Estancia’s starting goalie, senior, Victor Jacinto, slide tackled a Saints offensive player. Jacinto was yellow carded, therefore having to be subbed out by Pablo Alcala, who then remained in goal for the remaining of the first half. Saul Ortuno, a forward and Junior at Santa Ana High School shot and scored the first goal of the game, which jump started the motivation in the teams. The Saints scored once again in the last 2 minutes with first half lead 2-0. Only 12 minutes into the second half Estancia’s Carlos Delgado, senior, playing right wing, scored off of an assist by senior, defensive midfielder, Gerardo Leon Camberos. In the last 2 minutes junior, striker, Marcos Arreola, scored a banger assisted once again by Camberos ending the game in a tie. In the second half Jacinto started in goal once again and ended up shutting down the saints with 9 shots saved. After assisting both of the goals, captain, Camberos was asked what the cause of his motivation was and responded, “My motivation was my Grandpa who recently passed away. I was trying to score a goal for him but instead I ended the game with two assists. I left satisfied with the assists." The next game for Estancia High School will be their rivalry game on Wednesday January 9, 2019 against Costa Mesa High School at Jim Scott Stadium at 5pm. 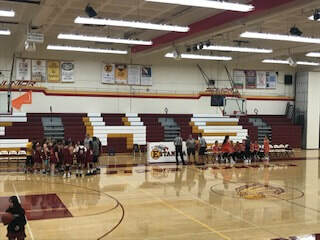 Estancia High School Girls’ Basketball lost to St. Joseph High School, 63-32, on pre-season scrimmage on November 9, 2018. St. Joseph started the quarter with the ball in their position. Estancia had an unproductive quarter until senior, Dayana Martinez entered and scored their first few points. 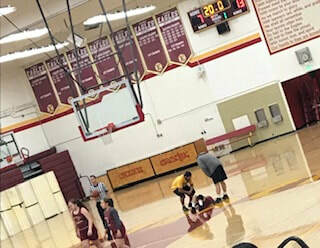 A few seconds later senior, Daisy Albarran, was injured and then removed from the game in an attempted layup. The ending score for the first quarter was 13-7, in St. Joseph’s favor. In the second quarter, Estancia came out aggressive and physical sending the Jesters to the foul line where they scored the majority of their points. Senior, Queen Ceruti, recorded Estancia’s first three pointer of the game bringing them within 15 points at the half, 31-16. Both teams came out aggressively in the third quarter with many trips to the free throw line and buckets being traded back and forth. Coach Barry Fryslie stated, “Our team played really hard, I was really glad that they were passing the ball during the game. They played aggressive on defense, we were worried they wouldn’t play aggressive because we are a young team.” The Jesters pulled away in the third quarter with a 23 point lead, 49-26.